A student project from the University of Texas – Architectural Engineering program. The Civic Tower of Pavia was built in Pavia, Italy in the 11th century. 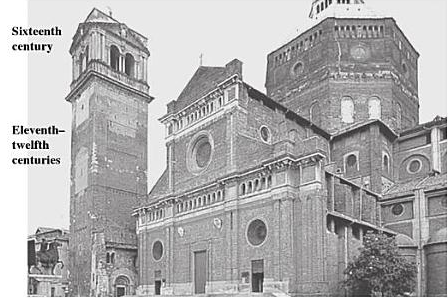 It was located adjacent to the Pavia Cathedral shown in Figure 2. At its peak Pavia was home to many similar towers, when it became known as the “City of 100 Towers”. In 1583 construction began on the addition of a belfry to the top of the tower. [a] The Civic Tower of Pavia was built in three to four different stages, starting in 1060 and finally completed in 1598 with the completion of the belfry tower. On the morning of March 18, 1989, bricks began falling from the tower, leading to its sudden collapse. The entire tower was reduced to a pile of rubble shown in Figure 1. The collapse killed 4 people and injured 15 more. The reason for the collapse was speculated and many tests were done to determine the reason for failure. A definite conclusion was never reached regarding the single reason for the towers failure. However, many speculations were made. For many, the 16th century belfry addition may have prompted the collapse. [c] The added weight plus the excavation of the wall to insert a staircase may have severely weakened the structure. 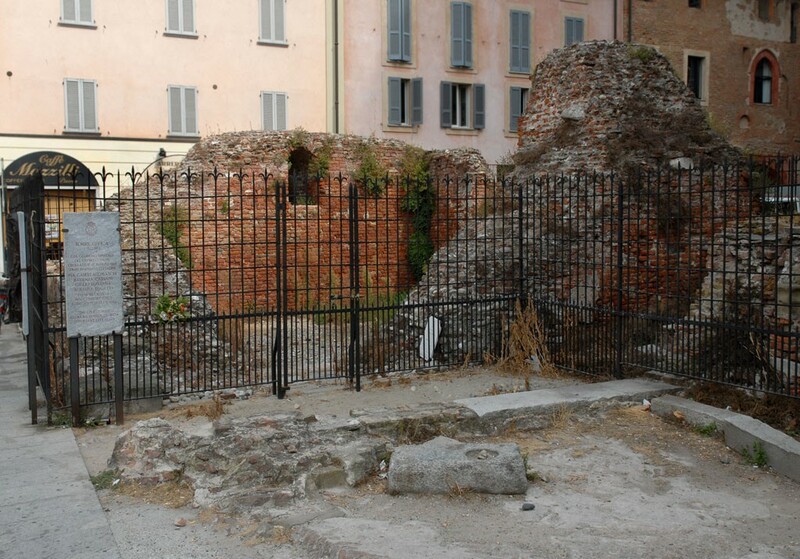 Masonry creep could also have contributed to the weakness of the structure. Creep depends on the stress level and the temperature and humidity conditions and are increased by cyclic action due to wind, temperature variations or vibrations induced by traffic or the ringing of the bell. 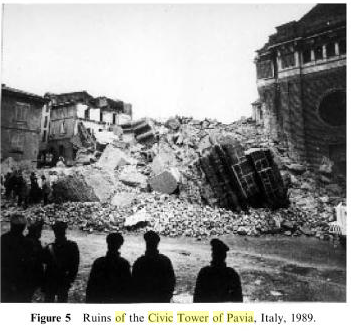 [d] The collapse of the Civic Tower of Pavia led to the serious investigation of stabilizing the Tower of Pisa. Ultimately, many speculate that old age accelerated by a slow chemical reaction between the medieval and more modern mortars used in the stonework could have led to the towers collapse. [a] The definite reason for collapse though has never been determined, and the spot where the tower once stood houses a shrine of the remains of what once was, as seen in Figure 3 above.